The sad and tragic case of Terri Schiavo forms a backdrop for the concerns of this Faith and Health. Religion, politics, law, and science converged in the public debate concerning whether Terri might be disconnected from life support systems. Years after she experienced severe brain damage, her husband carried out her wishes that she not be sustained medically should she have no reasonable chance for recovery. The debate involved every branch of government and seized the public’s attention. The heart of her story, however, was a matter of personal faith and how it relates to health decisions at the end of life. Faith and health are the two points of reference that define this book, figuring prominently in the divisive and often acrimonious social debates about bioethics, as the Schiavo story shows. 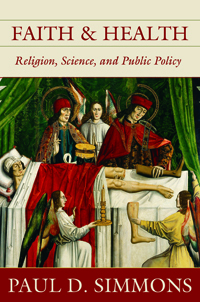 How should religious beliefs be related to public policy? Should religious groups try to force their moral opinions on all Americans? The issues are too important to ignore. They affect personal choices as well as social relations. Faith needs the informing and analytical perspectives of science. Faith that is severed from basic information is like a heart without a head. This book brings science and faith together in the task of discerning the will of God and responding to the challenge of human pain and suffering. Commitments to religious liberty are also necessary to civil discourse and legal resolutions of complex issues. The First Amendment is a vital factor in discussions of issues in medical ethics. Relating religion, ethics, and science in matters like evolution, embryo stem cell research, elective death, and abortion call for careful attention to both establishment and free exercise questions.